Summary Judgement: A web series that finds comedy in the honest, if common, details of a recently moved in couple. I think I said this when I reviewed Jane Espenson and Brad Bell’s Husbands, but I’ll say it again now; comedy, and especially relationship comedy, is a tough thing to produce. In my estimation it is a question of originality. For as long as there has been television, there has been the relationship based situation comedy. Thus the challenge is to be innovative without descending into the sort of painful frivolity which emerges out of something like NBC’s Whitney. The Newlymovedins finds its unique voice in the seemingly mundane details that emerge out of two people deciding to move in together. 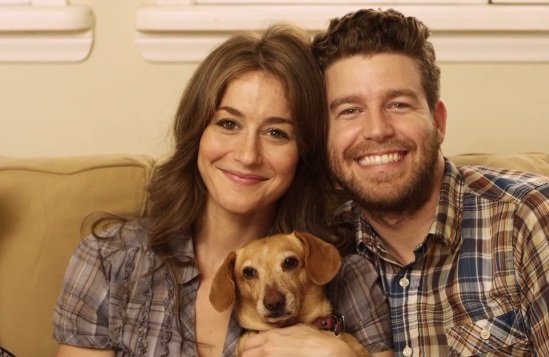 Like the show’s theme song says, Kat (Kat Foster) and Scott (Scott Rogers) have decided to take their relationship to the next level. In this, they are like so many real life couples who want to be together but for one reason or another aren’t yet married. Despite occupying a new-ish relationship niche, a sense of ubiquity emerges from these characters. Granted they are a straight Caucasian couple, but the lack of stereotypical character traits, save for Scott’s penchant for the “idiot’s guide” series of books, shifts the focus toward their roles within the relationship and the relationship itself. What emerges are a series of vignettes that invite the audience to draw parallels to their own experiences, regardless of who they are or the specific details of their own relationship. How then does this web series take the mundane and make it funny? Mostly, it is in the timing. Foster, Rodgers, and director Jess Brickman have a fantastic formula for delivering punch lines at the exact right moment. Moreover, there’s always some twist on the expected result. For example, episode four sees Kat overwhelmed by the couple’s lack of a plan for life, the universe, and everything. After initial attempts to console Kat fail, Scott inquires about female hormones. The expected “How could you say that?” from Kat never happens. Instead the gag shifts to Scott mishearing a word. What began as man being a man turns into a comedy of errors. Oh and there’s also a near catatonic dog named Loafie who, through some ingenious camera shots, ends up as the series’ straight man. Factor in the polished production values and there’s really not much this series does wrong. Yet, if there is one aspect of being newly moved in that I think the show missed, it’s the question of going out. Yes, I understand the series is called The Newlymovedins. However, every couple gets to a point where going out becomes a chore rather than something to look forward to. I can only imagine the sort of conversation that would emerge from Kat and Scott trying to decide what they should do on a given night. At approximately three minutes per episode, the first season has a total run time of just under half an hour. For that reason, it is pretty easy to go start to finish on The Newlymovedins in one sitting. So long as you’ve lived with another person, you’ll be hard pressed not to find something to laugh about within this series. Here’s hoping for a second season. For your viewing pleasure, here’s episode one. Click here to head over to The Newlymovedins youtube channel.